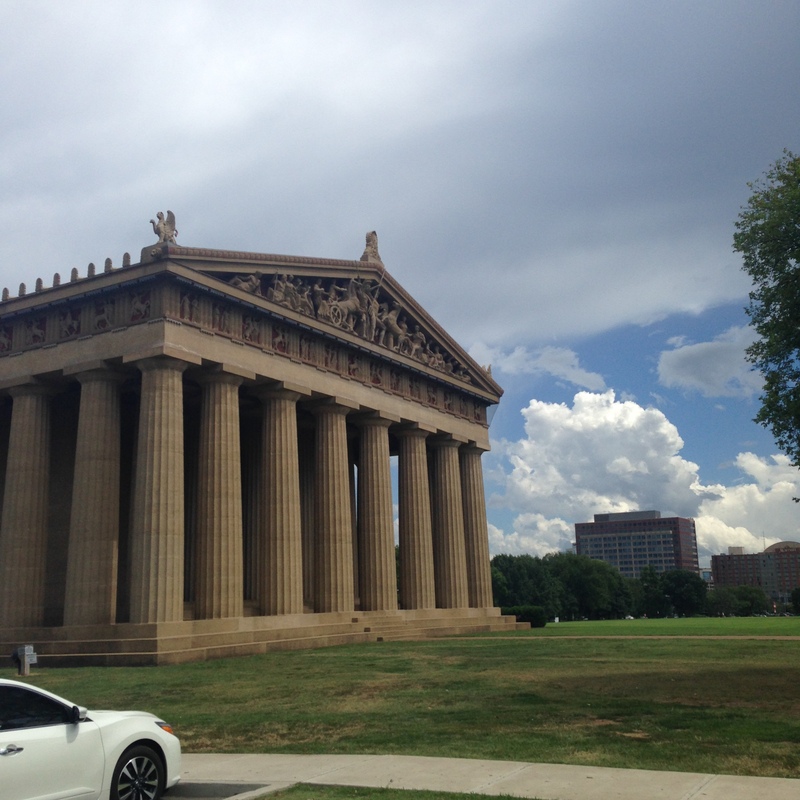 After some early trip turmoil, we’ve made it to our first US city on our trip itinerary, Nashville Tennesse. We weren’t even in town yet and we’d been spotted! After spending the weekend back in Philly, it took until Monday to get the ‘Stang up and running again. Joe, the lead mechanic from AmericanMuscle, was kind enough to load up an F150 with a new set of wheels and accompany us back to our abandoned vehicle. Over the weekend it had been decided that the only way to fix the problem was to change the mags altogether. Thus, early Monday morning in the blistering hot heat, we pulled up to the Mustang where we had left it in Elizabethtown and re-installed the stock 19″ mags. Actually, Joe did the install. Employing chassis construction crew tactics, Andrew, Alex and myself just chatted and watched as he did all the work. Thanks Joe. Now equipped with the factory 19″mags and a fresh set of Pirelli P-Zeros (250’s up front, 275’s in the rear), we finally hit the interstate a half hour to noon with 10 hours of driving ahead of us. It was naught 15 miles into Nashville: take 2 when I accidentally christened the left front tire by flattening a small rodent. My condolences to Mickey and co, but at least it was quick. Apart from that one incident with the mouse, the drive to Nashville was uneventful – the car ran flawlessly. The only notable grievance would be one with other drivers. When I drive long distance, I like to set the cruise control and not touch the gas pedal or the brake until I absolutely have to. 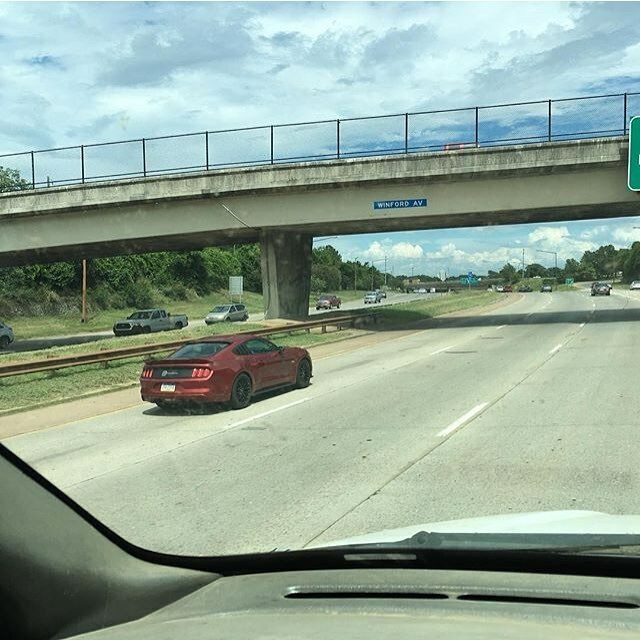 Back home, the left lane is basically reserved for passing the slower traffic on the right. On interstate 81 south, however, it seems the left lane is used as a means to blockade the flow of traffic, almost as if it is some sort of sick game the locals play on the out-of-towners. The worst was a 10 mile stretch where one Fedex b-train attempted to pass another, both pushing an impressive 58 MPH. Perhaps I need to be more patient, but I’m young, in a fast car, and two days late. Either speed up or move over! Roughly 20 miles west of Knoxville, we creeped up on an orange and white Challenger R/T. With the cruise set at 80, we pulled up door-to-door and so began the dance. Not wanting to be passed by a Mustang, the Challenger goosed it and rocketed forward. Us, not wanting to engage in any kind of race, simply remained on cruise control and adopted the slow-but-steady approach. Sure enough, traffic had bunched up a little further down the road (again, those people that block the left lane!) and we were once again on the tail of the Challenger. Traffic loosened up and with our lights in his rearview, the Challenger surged forward once more. We caught him about 5 minutes later due to a similar situation, and from this point forward we cruised together. Sometimes with him in front, sometimes with us, always keeping a brisk pace. After about an hour of playing cat-and-mouse with the Challenger, he ducked out near Cookesville and we waved each other goodbye. Muscle car respect is a real thing, regardless of manufacturer. Pulling into the Music City at 10:30pm, we rolled through downtown en route to the Nashville Downtown Hostel. 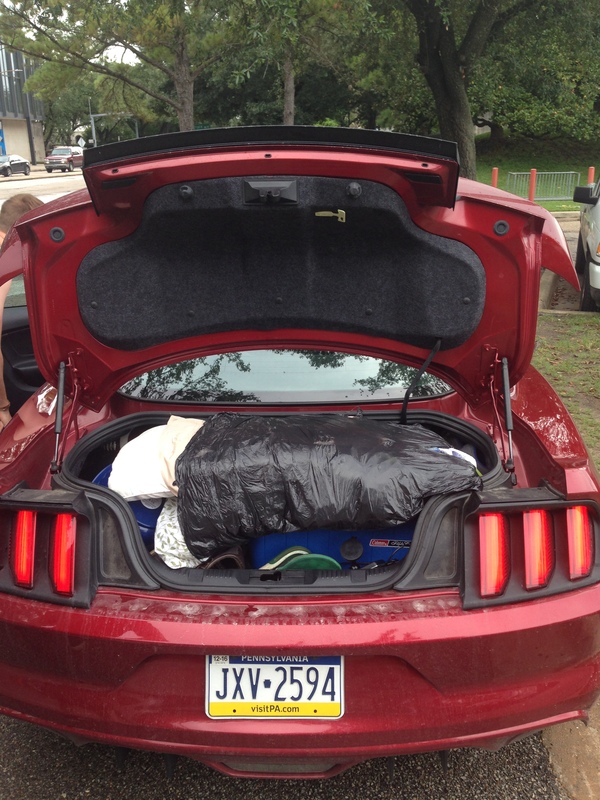 A few people gave us thumbs up as we the Mustang snarled through the city, and at one stoplight, a taxi van full of young ladies pulled up to us and attempted to start a conversation. I say attempt, because unfortunately, at this point in the day, my brain was literally mush. After a long drive and not much sleep over the weekend, I did not process a single word they said. Poor Alex, for the last hour he had to repeat himself two or three times for every driving direction he’d give me. Anyway, it’s safe to assume those girls were giving Alex and myself very nice compliments – probably which bore no relation to the sinister beast we were sitting in. One thing we immediately noticed upon entering Nashville is the heavy police presence – cop cars everywhere (and tons of undercover ones – how many Chrysler Sebrings have you seen pull someone over?). Thanks to MMD, our Ruby Red was done up specifically for the American Muscle car show, and one area that was modified was the exhaust. This steed now sports a side-exit exhaust (behind each door) kit and is hella loud. Just firing up the Coyote unleashes a disturbingly loud snarl, and stepping on the pedal results in a note that sounds as if it came out of the shadow realm. On deceleration, the engine crackles and pops like a deranged, rabid beast. Thus, not wanting to attract any unnecessary noise citations, we kept the shifts short and slow. The only negative is that during long cruises, the noise can become tiresome. Around 2000-2200 RPM (70-80 MPH) there is a slight drone. We’ll gladly take the drone of this V8 over the drone of the leaking exhaust on the Focus, which sounds like a bleating goat. Andrew must be very miserable by now. Ha, what a pylon. 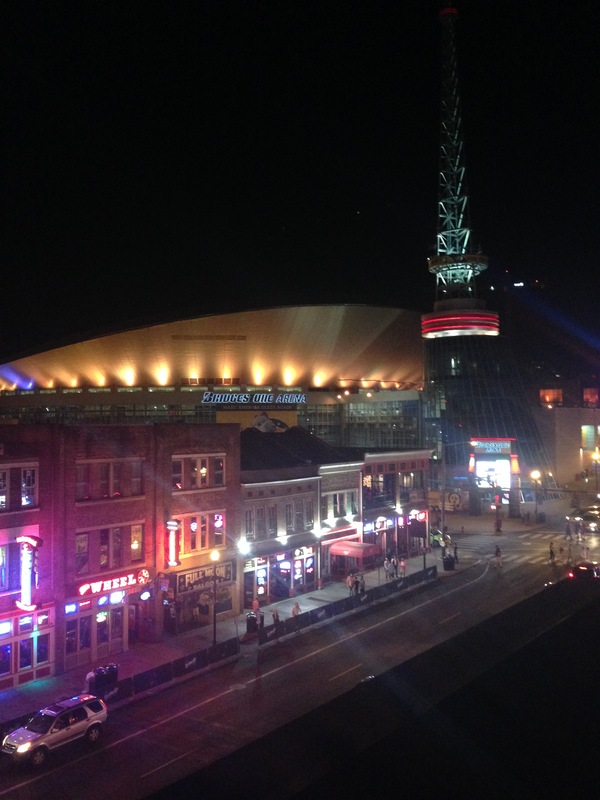 If you only had one day in Nashville to experience everything, what would you do? Do what we did: try as many beers and see as many of the live bands as humanly possible. Tuesday started off slow. Awaking late in the morning, Alex and I hopped in the Mustang and headed off towards Centennial Park, situated about 5 miles north of our hostel. The park is gorgeous, consisting of several museums (Centennial Art Center and the iconic Parthenon), large gardens, a small lake, walking trails and even a beach volleyball court. Not in the mood for history, we forewent the Parthenon tour and elected instead to toss a pigskin on the sprawling grassy grounds while soaking up some rays. Hot and sweaty, we spoke with some locals enquiring about the location of any local beaches. “Y’all”, as we were called, were directed to Percy Priest Lake to quench our desire to swim, a quick 20-minute drive away. Upon driving there, something really cool happened. My phone buzzed, and I looked down to see why. On my homescreen was a picture of our car, on the highway we were currently driving on! Both creeped out and eerily excited, I showed the picture to Alex (he was driving) wondering if he knew who the_dwhite was. He didn’t, but nonetheless, we were ecstatic. Exchanging a few Instagram messages with the_dwhite, we found out he was in a dump truck on I440 when he spotted us. Really cool! This was the highlight of our afternoon, as upon arrival at Percy Priest, we found out it was only open on weekends. Thus we decided to get lunch instead. Having being snubbed for lunch by P.K Subban (we tweeted him that two MTL boys were in town) and Carrie Underwood way out of our league, we decided to eat lunch just the two of us and stopped in at Sal’s Pizza where we had some of the best yet greasiest pizza of our combined lives. The day may have been tranquil, but starting at 8:30pm we turnt up hard. Music City lives up to the name, as when the sun sets, Broadway street lights up full of neon colors, a live band jams in every bar and the air is rife with excitement; street vendors peddling the world’s best hot dog to hungry passerby’s and shops stay open late to sell that last matching pair of cowboy hat and boots. And that is probably where the term “Nashvegas” comes about, as Broadway street is an eerily similar, just smaller, version of the Vegas strip (casinos replaced with live bands playing in every bar). Country twang flows out the entrance of each establishment, accompanied by a blast of ice cold air conditioning as the bouncers quickly card those waiting at the door (peach fuzz or mountain man, everyone gets carded). Unsure of which place to hit up to start the night off, I arbitrarily pointed to one place that looked fairly busy. We immediately went upstairs to the balcony, where another live band was playing, and ordered a couple of drinks. Standing at the rail of the balcony, we were able to see the all the shenanigans going on throughout the length of the street. We crushed a few drinks, and deciding the vibe was a little too mellow, ducked out looking for something a little more bumpin’. We found this at a place called the Tin Roof, where the band was killing it with their song selection and the audience loving every bit of it. “The Love Trucker” (pronounced the “luuuv truuckher”), as they were aptly called, were blasting out all the hits involving pretty ladies, lifted trucks and of course, Tennessee bourbon. I ordered the cheapest bourbon (unfortunately I don’t recall what it was called, but it cost $6) and Alex the cheapest beer. A few songs and a few more drinks later, Alex and I grew restless and decided to see what else Broadway had to offer. Besides, the Love Trucker had just belted out a great rendition of Earth, Wind & Fire’s “Dancing in September”. Surely, they weren’t going to top that. Back on the street, we scanned the area for something next level, a place that would crank our party up a notch or two. Towards the south end of the street there seemed to be a massive gathering of people pooled at the entrance of this one place, Honkeytonk Central. Multiple security guards were out front doing crowd control and ID checks whilst several police officers were having a discussion with one seemingly upset young male. Looked pretty chaotic, and this is exactly what we were looking for. We approached, and as we got closer, echoes of the band began vibrating through our cochleas. There was a lot of shouting, some screaming – but all of this was being sung to a definitively country chord. Had we just stumbled upon a metal country band?! We had to find out. The atmosphere was electric. The bar was packed, median age probably being no more than 28. The band was upfront, shredding a Blink 182 song and the audience was loving it. Girls and guys, drink in hand and hands up in the air, moving and swaying as “What’s My Age Again” reverberated through the rafters. It was wild. We sat down at the bar as the song ended and again, ordered the cheapest whiskey and the cheapest beer (there is definitely a theme going on here…). The audience, pumped up by the last Blink song, called for another one. Seeing the opportunity, the band quickly hustled for tips, which the semi-drunk dancers were more than happy to provide. After all, it’s all about making a night to remember, isn’t it? After Honkeytonk Central, we hit a few other places up, but none were exhilarating or as thrilling as Honkeytonk. Who knows if Honkeytonk is always lit like that, but on that Tuesday night, with that crowd and that band, it was hands down the place to be. Next Entry Mustang Challenge | New Orleans Days 5-7 – Flying Burritos, Gators & Bourbon St.